What Are the Duties of Ministers of the Church? The following excerpt is from Theological Commonplaces: On the Ministry II in which Gerhard expounds on the duties of ministers of the Church. 265. The priesthood “is not leisure but the highest of tasks,” Bernard writes somewhere, and “episcopacy is the name of a work, not of honor,” according to Augustine (De civit. Dei, bk. 19, ch. 19). Now that we have explained the causes of the ecclesiastical ministry and its necessity, as well as the utility and dignity depending on them, it remains for us to speak about the duties of ministers of the church. The duties are enumerated in different ways by different writers. Hugh of St. Victor, De sacr., bk. 2, part 2, ch. 5: “Every administration of the church consists in three things: in the sacraments, in orders, and in precepts.” Jerome, on Leviticus 8: “The duties of the priest are to learn something from God or to teach the people or to pray for the people,” etc. For our listing to be quite complete, however, we say that the duties of the ministry are most accurately evaluated on the basis of the end for which the ecclesiastical ministry was divinely instituted and is still being preserved. In earlier sections we said that this end was twofold: namely, the principal end, the glory of God; and an intermediate end, the conversion and salvation of men. An intermediate end has the character of a means through which one reaches the principal and ultimate end. From this it has even received its name. The duties and actions of ministers, through which God wishes to be efficacious for the conversion and salvation of men, have to do with attaining the intermediate end. (II) To the Word are added the Sacraments, the signs of divine grace and of the evangelical promises. Thus the ancients call them the ὁρατόν or “visible” Word. Therefore the second duty of ministers is the administration of the Sacraments. 1 Cor. 4:1: “This is how one should regard us, as servants of Christ and stewards of the mysteries of God.” Matt. 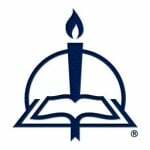 28:19: “Go, therefore, teach all nations, baptizing them.” Here the preaching of the Word and the administration of Baptism are connected. (III) However, every effort of ministers is in vain without the blessing of heaven. 1 Cor. 3:6–7: “I planted, Apollos watered, but God gave the growth. So neither he who plants nor he who waters is anything, but God who gives the growth.” Augustine, Sermon 4 de verb. apost. : “We speak, but God educates; we speak, but God teaches; He who teaches in the inner parts has His throne in heaven.” Therefore the third duty of ministers is to pray diligently for the flock entrusted to them, 1 Sam. 12:23: “Far be it from me that I should sin against the Lord by ceasing to pray for you and to teach you the good and right way.” Here the instruction of the hearers and prayer for the fruitfulness of the Word are connected. (VI) In the exercise of divine worship, certain solemn, public rites should be preserved that aim at good order and decorum and were introduced by the pious consensus of the whole church. Therefore the protection of ecclesiastical rites, which were approved by serious consideration and which give useful instruction concerning many topics in public assemblies, also pertains to the ecclesiastical ministry. Nor should a minister change them, leading to scandal in the church, because of some private desire of his mind. Consequently, the sixth duty of ministers is the preservation of ecclesiastical rites. (VII) Finally, duties of charity leading to the alleviation of poverty and affliction are owed to those among the hearers who are orphans, widows, poor, homeless, and ill. Therefore the care of the poor and the visitation of the sick pertains to the minister of the church, that he might faithfully collect and dispense money destined for the use of the poor. If this duty has been entrusted to the ecclesiastical treasurers, he should exhort his hearers diligently to demonstrate beneficence toward the poor. He should also see to it that the dispensing of the goods of the church is done lawfully and correctly (1 Cor. 16:2; 2 Cor. 9:1; etc.). All told, therefore, there are seven duties of ministers of the church. We can conveniently relate all the rest to those seven: (1) the preaching of the heavenly Word, (2) the administration of the Sacraments, (3) praying for the flock entrusted to them, (4) the honorable management of their life and behavior, (5) the administration of church discipline, (6) the preservation of ecclesiastical rites, (7) the care of the poor and the visitation of the sick. We shall discuss each in greater detail. From Theological Commonplaces: On the Ministry II, pages 100–101. English translation © 2012 Concordia Publishing House. All rights reserved. 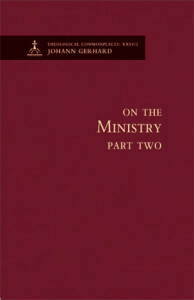 To order On the Ministry II, please contact CPH at 800-325-3040 or visit www.cph.org.